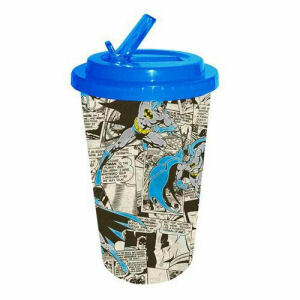 We have Just Sold out of Batman Comic Book Pages Plastic Flip Straw Cold Cup. Not to Worry! Fill in the Notify me When Available and you will be the first in line for our restock of Batman Comic Book Pages Plastic Flip Straw Cold Cup !! From the Batman collection by Silver Buffalo. Batman Comic Book Pages Plastic Flip Straw Cold Cup. Complete with sturdy lid that features a convenient flip straw to help avoid spills. Hand wash only. Not dishwasher safe. Do not microwave.